huge congrats, dear msmoney, to reach the goal!!!!!! and you've chosen such a matching card as an advertising for your GREAT COUNTRY!!!! :-) HAPPY POSTCROSSING!!! Congratulations- for both of you!! This one is a real special!!! Congrats to all of us postcrossers who keep this project alive! Congratulations to both of you - and to all the Finnish postcrossers who made this happen! Congratulations to both sender and receiver on this very special card! Congratulations to both sender and the receiver!!! And a HUGE THANK YOU TO ALL FINNISH POSTCROSSERS!!!! IT'S A GREAT PLEASURE TO POSTCROSS WITH YOU!!!!! Congrats to sender and receiver..what an amazing card..a postcrossers dream "sigh"
One million — that's great!!!!! How lucky that you've received the postcard with this special Postcrossing ID! I wish for you lots more special exchanges with fascinating people all over the world. Congratulations to both on this very special postcard! What an honor to receive/send such a card! Wonderful postcard showcasing Finland. Congratulations to both of you for the 1,000,000th postcard from Finland. Congratulations to the sender and the receiver! A very special card! What I like the most about this postcard is that both, the sender and the receiver, are long-time postcrossing enthusiasts, especially the sender: over 5 years of postcrossing! They both well deserve this lucky number! Congratulations Finland! Wow, what a great number!!! Which country will be next ? >>> Supposedly, it will be USA. According to the forum they are already passed US-993660, just a little bit more than 6000 to go. Stort Grattis till Finland - hoppas att Sverige kan ta efter er :). Mahtavaa! Muutaman kerran olen miettinyt miten selvittäisin kuka onnellinen on tuon "miljoonannen" kortin lähettäjä ja naps! vastaus tuli nyt, kun arpa heitti osoitteesi minulle! Conglaturations! To be marvelous the number 1 million! Congratulations to both, sender and receiver! It's really amazing! Fabulous card to celebrate Finland .. land of my dreams .. and fabulous number 1,000,000! Well done! 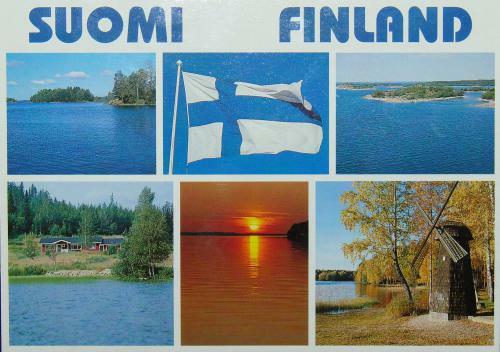 I'm so glad a dear Finnish friend introduced me to Postcrossing some years ago. My congratulations with this remarkable milestone and beautiful card!